Donations to the Medical Program fund animal medical care and procedures beyond the City of Iowa City’s approved medical budget. Animals suffering from treatable conditions get the medical attention needed and a second chance. 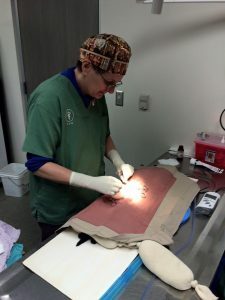 To ensure they start their new life happy and healthy, all animals adopted from the Iowa City Animal Care and Adoption Center receive required vaccinations, de-worming, flea and tick treatment, ear cleaning, a nail trim, and a bath. Some animals need more extensive animal medical services or treatments involving a larger sum of money. This is Bobber. He was hit by a car in June, 2012 and found near Lake McBride. 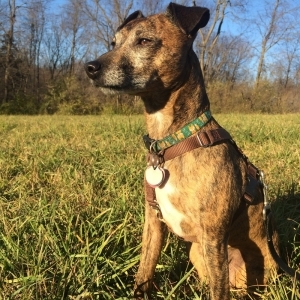 Bobber is now a happy, healthy 3-legged dog living in a loving forever home! Thanks to our medical fund, animals that might otherwise be euthanized in another facility are able to receive needed treatment and are adopted into loving forever homes. We help many animals every year by providing funds for diagnostic testing, X rays, amputations, treatments, medications, and surgeries. $5 pays for upper respiratory treatment for 2 cats for 21 days. $25 pays for 30 days of flea treatment for 25 cats. $50 pays for an eye or ear surgery for one dog or cat. $200 will pay for one large dog’s heartworm treatment. Donate today and give an animal a second chance!